Ahmed Rashid. Photo courtesy Chatham House. Ahmed Rashid has 1 media appearance. Ahmed Rashid,"Pakistan on the Brink: The Future of America, Pakistan, and Afghanistan"
According to preeminent Pakistani journalist, Ahmed Rashid, U.S.-Pakistan relations are in a state of a virtual meltdown as American strategy has reflected contradictory policies and intense political infighting. What are the possibilities—and hazards—facing the United States as it withdraws from Afghanistan and as it reviews its long engagement in Pakistan? With bin Laden’s death in the rearview mirror, what remains of al-Qaeda’s strength and its ability to adapt and reorganize—and where is the Taliban? Join The Chicago Council and Ahmed Rashid as he discusses what the immediate future holds for Pakistan and Afghanistan, and what America’s choices are going forward with this critical relationship. Ahmed Rashid is a Pakistani journalist based in Lahore. He presently writes for the Financial Times, the International Herald Tribune, the New York Review of Books, BBC Online, The National Interest, and several other academic and foreign affairs journals. Previously, Rashid was the Pakistan, Afghanistan, and Central Asia correspondent for the Far Eastern Economic Review for twenty-two years. He is also the author of four books, including the recently updated second edition of the best-selling Taliban. He appears regularly on NPR, CNN, and the BBC World Service. 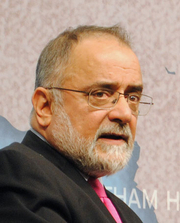 Rashid was educated at Malvern College in England, Government College in Lahore, and at Fitzwilliam College, Cambridge University. His latest book, Pakistan on the Brink: The Future of America, Pakistan, and Afghanistan, will be available for purchase and signing after the program. Four years after his Descent Into Chaos, the Lahore-based Pakistani journalist reassesses the situation in Pakistan and Afghanistan and offers suggestions for American foreign policy in the region. He pays particular attention to the role of the Taliban and the reliability of American allies. Ahmed Rashid discusses Descent into Chaos: The United States and the Failure of Nation Building in Pakistan, Afghanistan, and Central Asia. Ahmed Rashid is currently considered a "single author." If one or more works are by a distinct, homonymous authors, go ahead and split the author. Ahmed Rashid is composed of 3 names. You can examine and separate out names.